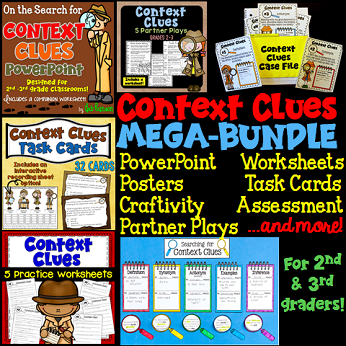 Context Clues: Read Alouds with FREE Printables! As a teacher of English Language Learners, I always spend quite a bit of time each year focusing on context clues. I feel that it's essential to teach students how to use clues within the sentence and in surrounding sentences to "crack" the meaning of an unknown word. I use a detective theme, and students always respond well to this analogy. They enjoy "putting on their detective hats" and "solving the mystery" regarding an unknown word. 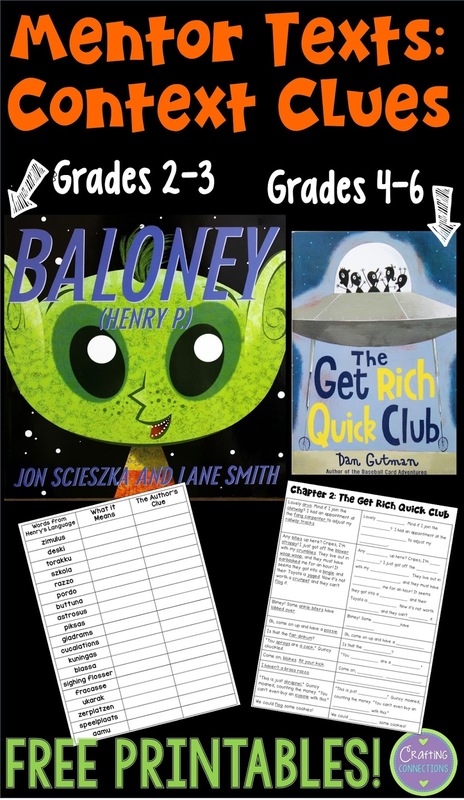 The picture book Baloney (Henry P.) by Jon Scieszka is perfect for students in 2nd and 3rd grade classrooms. In this book, the main character is an extraterrestrial named Henry P. Baloney. He is late for school and has to scramble to come up with an excuse for his teacher. What makes this book so fun, though, is that Henry uses his own language as he makes up an outlandish excuse for his teacher. In creating Henry's language, Jon Scieszka uses words from 17 languages on Earth (plus a spoonerism and a couple transpositions). The result is sentences like "...which made me exactly seven minutes late this aamu." When I read this book with students, I like to have them try to use context clues to determine the meaning of each foreign word. When I turn to a new page, I do not show them the illustrations right away. First, I read the page, and then ask the students if they can figure out what each unknown word means. Sometimes, it is impossible to decipher the meaning of the unknown words without looking at the illustrations (zimulus on the page above provides an example of this). Other times, the word is a cognate (like deski), making it easy to predict. Finally, there are words where students can use context clues found in the rest of the sentence or surrounding sentences (like torakku and szkola) to determine the word's meaning. I created this handout to use with this book. I place it below my document camera, and we record our thoughts as we progress through the book. The chapter book The Get Rich Quick Club by Dan Gutman lends itself to creating a fun context clues lesson for students in 4th, 5th, and 6th grades. In this book, one of the supporting characters, Quincy, is from Australia. She uses Australian slang phrases often, and it's super fun to try to use context clues to decipher what she's actually saying! As you can see below, Dan Gutman provides translations in the form of footnotes at the bottom of each page. I created the handout below to use with Chapter 2 of this book. I begin the lesson by telling students that we have an unusual, yet fun way to practice using context clues today! It involves reading a few chapters from this book. I explain that I will read a few pages aloud before starting the context clues activity. Then, I open up the book and start reading from the beginning of the book. (You'll likely succeed in enticing a few of your students to read the entire book on their own!) However, if you're running short on time, you can start at page 7, where Chapter 2 begins. When you reach page 11, distribute the handout. Tell your students that the rest of the pages in this chapter have similar phrases said by Quincy, and you will be stopping at the end of each page to give them time to use context clues, and then record their predicted translations on the lines. I suggest doing the first one together as a class. I hope you and your students enjoy these two mentor text lessons! 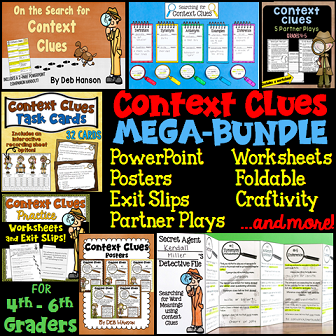 If you're looking for additional context clues activities, be sure to check out this blog post, where I share a free interactive lesson! 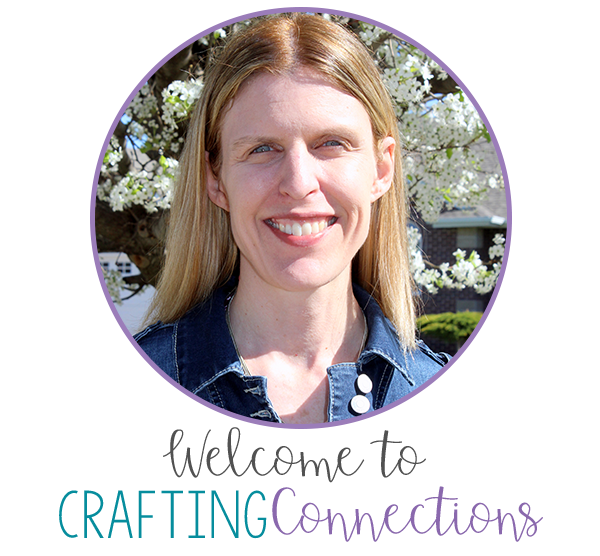 Also, feel free to take a look at the resources I have available in my TpT store. I've displayed images of my two bundles below, but all of these activities are available for individual purchase as well.